DropGallery was created by people who love their photographs as much as you love yours. Its creators have on several unfortunate occasions, lost all or parts of their photography collections due to catastrophic hard drive failures, lost or stolen computer equipment, as well as at least one accident involving beer. Every time an incident like this occurs photographs are lost forever. DropGallery was created to provide you with the simplest, easiest, and most convenient way possible to safely back up, view, and share your images with your friends, family, clients, and co-workers. We want to provide you with a safe and simple place to store and share your images with whomever you choose. We thought of other scenarios: a house fire, a flood, a robbery, where everything else you own is replicable except your photo collections. Just about everyone knows that you should back up anything you do not want to lose, but in the end most people are too busy, lazy, or just plain forget. We only remember once it is too late, this is where DropGallery comes in. We wanted to make it quick and easy for people to backup their photos so that even those without spare time will be able to do it. DropGallery is the easiest way to backup, synch, and share your photos. 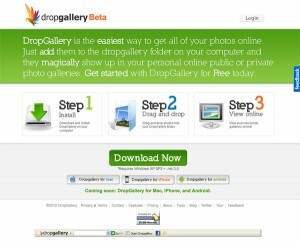 You can install DropGallery on any computer that you would like to sync some or all of your photos with. From then on all you have to do is drag and drop your photos into the DropGallery folder that appears in your Pictures file on your computer. We do the rest. You do not have to log into a website, or upload one photo at a time. Once you have installed the program and set up your account, DropGallery does all of the work for you. Just drag and drop your photos. DropGallery syncs everything you put in your DropGallery to your DropGallery Online. 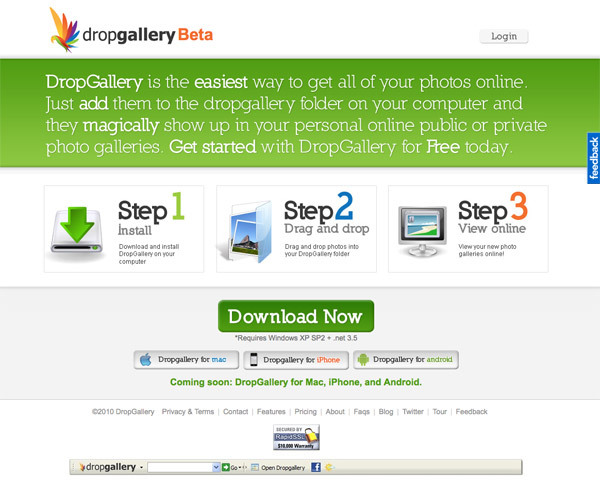 Your DropGallery Online is available for you to use from any computer anywhere as long as there is an internet connection. You can share your photos with your friends and family anywhere anytime by copying and pasting a link to your email and sending it to them. A user friendly image hosting solution. At the moment works only with Windows operating systems. Does not require you to upload images individually. Uploads in the background, without prompting your for input. The free package on the site offers 2GB of storage; paid packages on the site offer more storage space. This entry was posted in Internet, Website and tagged Free, Free photo hosting, Free storage, Image hosting, Photo sharing by aircraftplanet. Bookmark the permalink.